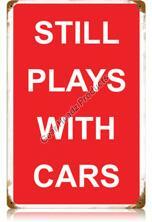 Tin sign says it all: Still Plays With Cars". What's wrong with that we ask? Sure beats relationships, or therapy. Sign measures a good sized 12" x 18", in overall size.